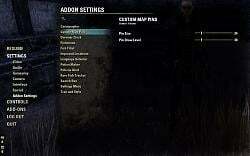 This adapter removes the second main menu entry "Addon Settings" and merges the settings pages into one main window. 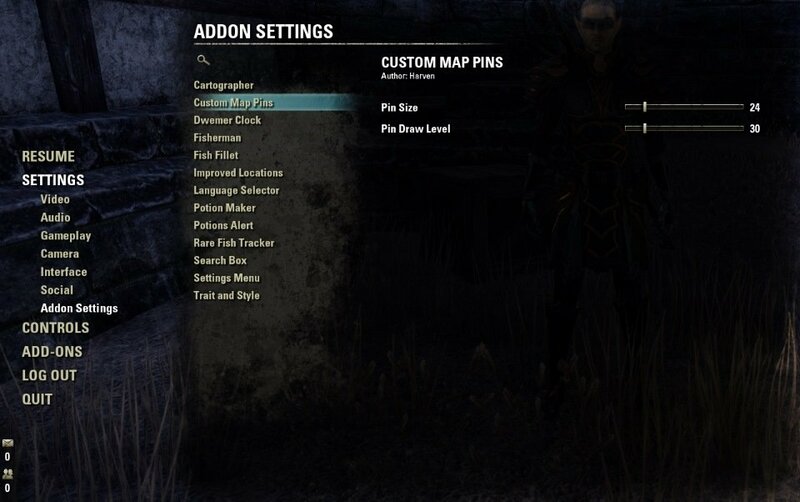 Both libraries, Harven's Addon Settings (most recent version can be found in Harven's addons) and LibAddonMenu-2.0, are a framework to simplify creating addon settings. 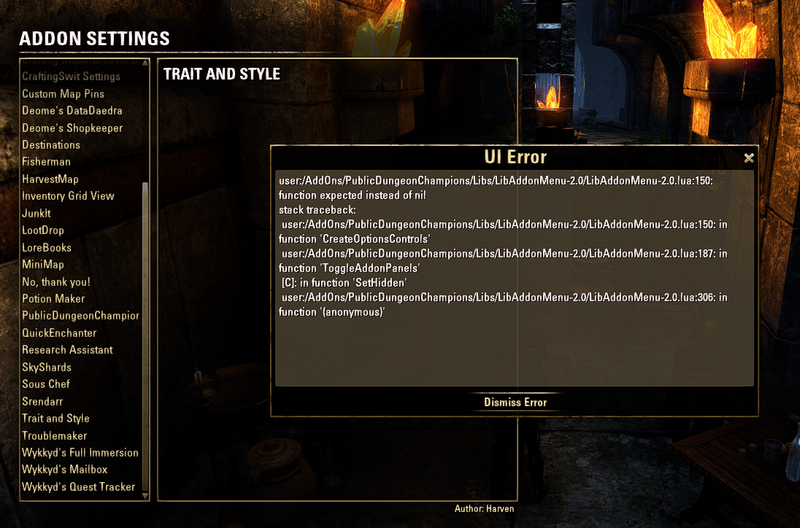 Although it is technically correct, many people think it is a "bug" having two main menu entries called "Addon Settings". Especially, if they just use one addon using "Harven's Addon Settings" library. This version of "Harven's Addon Settings to LibAddonMenu-2.0 Adapter" is re-written from scratch. It offers full API compatibility to addons using LibHarvensAddonSettings and integrates them to LibAddonMenu-2.0. You should not experience any change in behavior or missing features and at the same time have one "Addon Settings" main menu entry only. 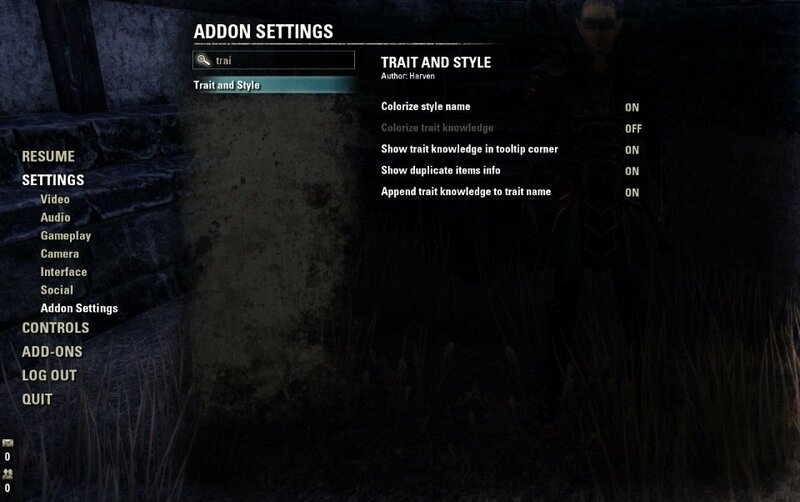 This addon will convert all of my addons settings layouts to LAM (as seen on the screenshot). I will not use it (obviously ) so please report any bugs/suggestions. - Edit controls in LAM will make '|' characters disappear, so it's somewhat hard to define your own fonts in some of my addons. - Make use of LibAsync, if available. - Support settings property "website", although LHAS does not support it. - Updated LAM to r17. I am redoing my settings and enabling addons one by one, and reading the description of this one, I am confused. 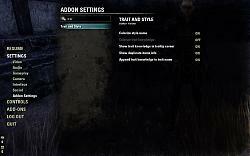 With no addons enabled, there is no second main menu entry "Addon Settings" . I just see Settings-Addons entry. Nothing in the main menu. Last edited by Octopuss : 10/21/17 at 06:14 AM. yes, because in US it is still night at weekend. Last edited by votan : 05/27/17 at 03:58 AM. Will this addon also address other addons that create their own catagory too? Like Shissu's LUA Memory manager? But interesting idea. I take a look. Short answer: Not without cooperation. Long answer: All important mehods are local and are not hookable. Without releasing a new Shissu Suite Manager, where is no way. You should ask Shissu first. Last edited by votan : 08/29/16 at 11:48 AM. Hi, I have uploaded a version of has2lam. It is re-written from scratch. If you had problems with the previous version, give this one a new try. That was my finding as well. It's bizarre. I wonder why it's affecting us like this? Or is it that other people only use Harven addons? In which case... why have the AS to LAM adapter in the first place?? 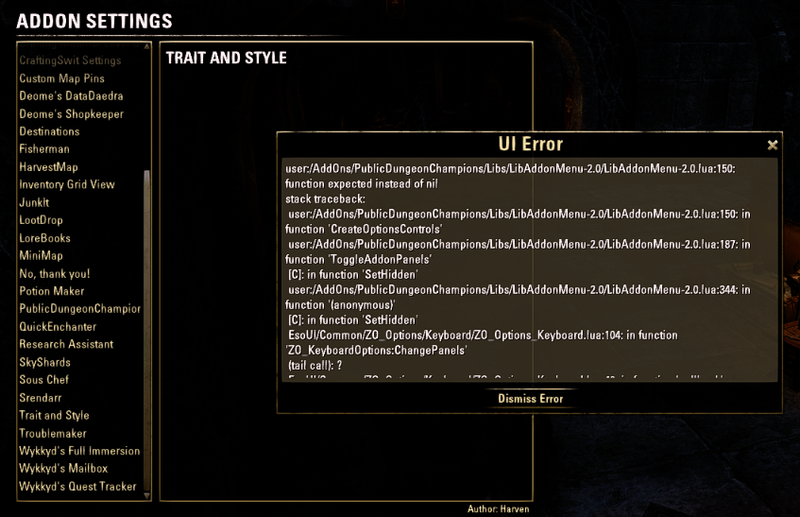 For me, this addon still conflicts with all others who have a settings dialog. I manually deactivated them one at a time and each time I deactived another one the same error message popped up, but with a different addon name inside the error messages. ... and then I gave up. Augh. that'll be fun. I'll try and do that when I have some time. I'm determined to figure this out because I love having a unified aesthetic, but I also love Harven's mods. Is it the exact same error that I get? With PublicDungeonChampions installed? Perhaps post a screenshot of your error if it isn't the case, it could help! Last edited by agamedivine : 04/11/15 at 12:15 AM. Last edited by agamedivine : 04/11/15 at 12:24 AM. I'm sorry to bring this up, but... I'm having the same problem as below. Roughly it seems like the panel isn't being properly sent to LAM, so whenever LAM tries panel:SetHidden(false) or self.panel:SetHidden(false), it flags an error. This is what I can tell from my limited knowledge. When I placed if checks in LAM to only run SetHidden if panel had been sent properly, all of my Harven's options stopped erroring out, but they were also blank. So it is specifically an issue with setting the widget to be not hidden rather than anything else. I've also tried updating LAM in all of my addons (I went through that tedious process, even checking for when people used different filenames), and that didn't change anything. So I do think this is something to dow ith how HAS2LAM is handling panel and creating a problem when LAM tries SetHidden. It should be enough to update LAM in HAS2LAM folder. Error messages says, that requested widget does not exists. I would like to report a bug - or well, a conflict I assume. After installing PublicDungeonChampions (link here) I get a few errors when I click on your add-ons in LAM. Had to add missing OptionalDependsOn line so that my LAM alwasy loads first.